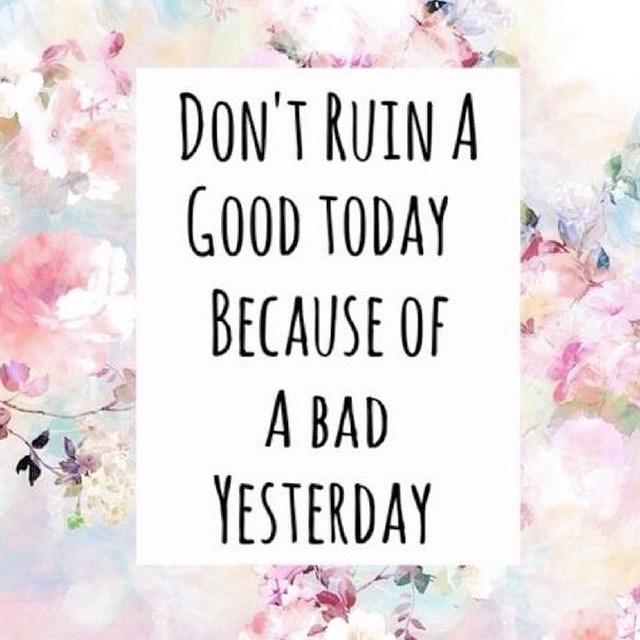 don’t ruin a good today because of a bad yesterday. More recently, I have been becoming more aware of how I can control my feelings and emotions. Yes, there are always outside variables that will try and get you down, but ultimately, it is your choice. Take today for example. I am a time management freak. I schedule everything and hate when people are running late. I had a meeting at work that went from being an hour and a half to being over three hours. As the clock ticked past, I grew more and more anxious and upset. Then, I took a minute to stop and think. Why was I feeling this way? It didn’t really matter what time the meeting ended in the grand scheme of things and I would get what I needed to get done, done. After thinking this through, I immediately felt better. No one and no thing can make you feel bad, angry, mad, stressed etc. unless you make it. I have gotten back on track with my workouts and my eats and I’m feeling good. Today’s workout was 5 miles with the last one sprinting every 30 seconds. It was really refreshing and I felt so powerful. I’ve also decided to start doing Yoga with Adriene‘s 30 Days of Yoga challenge. I know I definitely need to stretch more and dedicate some more time to getting in tune with my body, so I will gladly dedicate the 30 minutes or so to yoga-ing it out. Adriene makes it so fun and she’s got a great spirit. Plus, it’s free, so you can’t hate that. If you are a runner or do any really physical exercise, it’s always a good idea to spend some time stretching. This will help ease muscle pain and increase flexibility which can aid in performance further down the road. But more important than yoga, SUMMER IS COMING WHICH MEANS ZUCCHINI SEASON IS ALMOST HERE. I love love love zucchinis and find them incredibly versatile. So, when I found out that you could make noodles out of them. I was so game. I picked up a vegetable spiralizer off of amazon for $13 and went to the grocery store and got a massive zucchini for only $1. It was game time. 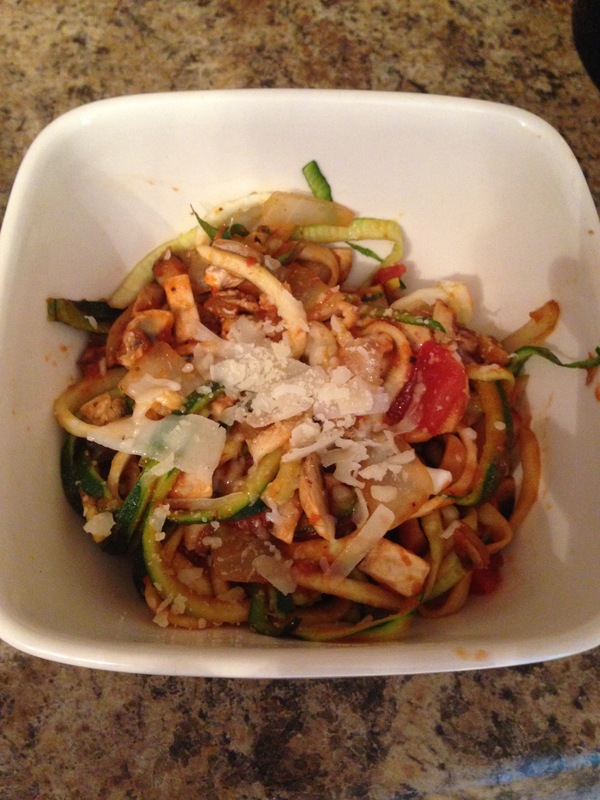 I quickly sauteed some onions and mushrooms, spiralized the zucchini and added it to the onion and mushroom mixture just for a couple of minutes so they got tender and added some sauce. In a separate pan, I browned some ground turkey. I compiled everything in a large bowl, gave it a stir and topped with parmesan. No complaints whatsoever. Highly recommended. homemade protein bars. 5 ingredients. let’s do this. My nutrition has been all over the place these past couple of days. Don’t ask me why, but I’ve been a ravenous monster every evening. Quest bars have often been my go to at night, but they’re really expensive and have a lot of mystery ingredients that I don’t always feel the greatest about eating. So, when I was perusing instagram and stumbled upon a recipe for homemade protein bars with ingredients I had in my pantry, I just had to make them. Homemade 5 Ingredient Protein Bars! Mix the first three ingredients together in a bowl with a spoon or spatula. Add water one TBSP at a time until the desired consistency is reached (you may not need all of it). Shape them into bars & put them the fridge for 30-45 minutes and voila! If you want, you can add some extra coconut flour to thicken up the batter. Nutrition (4 servings): 155 calories, 10 carbs, 9g of fat, and 10g of protein. This weekends workouts, unlike my nutrition, were on point. I have been trying to tone down my running a little bit because of some knee pain I had been experiencing, but I still decided (for no reason in particular) that it would be a good idea to run anyway on Saturday. My run was surprisingly enjoyable. I felt no pain at all and felt weightless and in the zone. I can only hope every run is just like this one to be honest. I also began Week 11 of the Bikini Body Guide today and it was just as enjoyable as when I did the Leg session in Week 9. I’m feeling so much stronger these days and I am really just soaking up these last two weeks. I have decided that after I finish the guide, I will be taking a week off from any and all exercise. 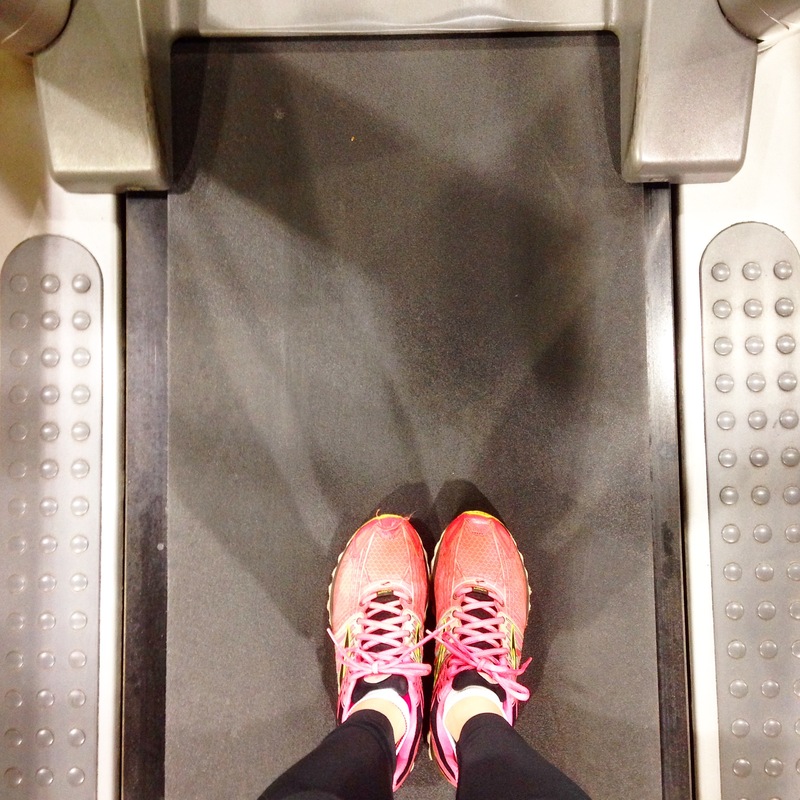 This will be a challenge, but I need a reset for my body and this will be the perfect time. After my brief hiatus, I will restart the guide again and I can’t wait to see how things have changed when I do the same circuits after building up all of this new strength and endurance. 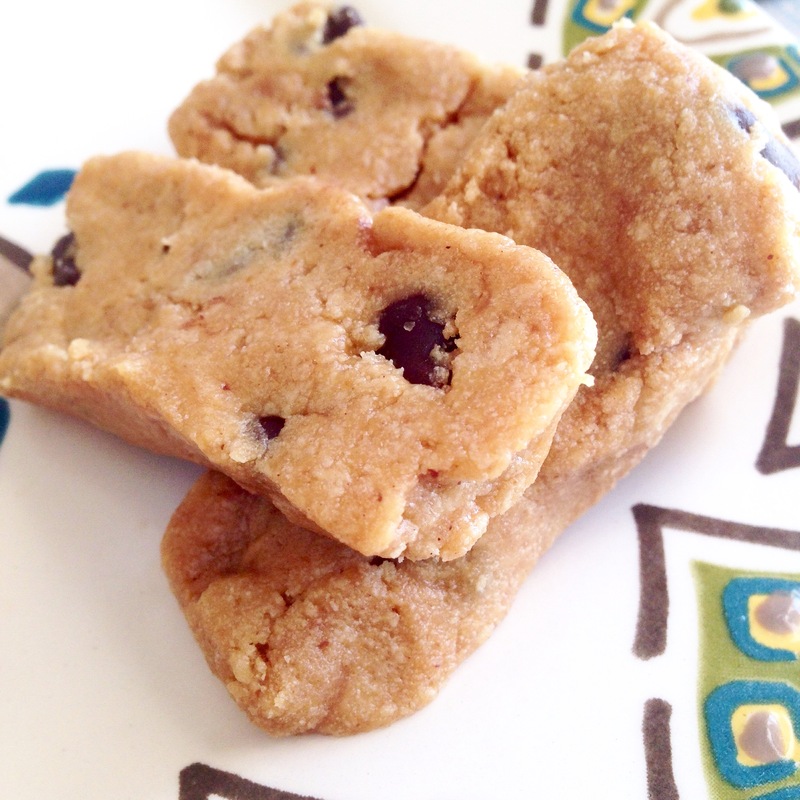 If you give the protein bars a try, let me know what you think down in the comments!